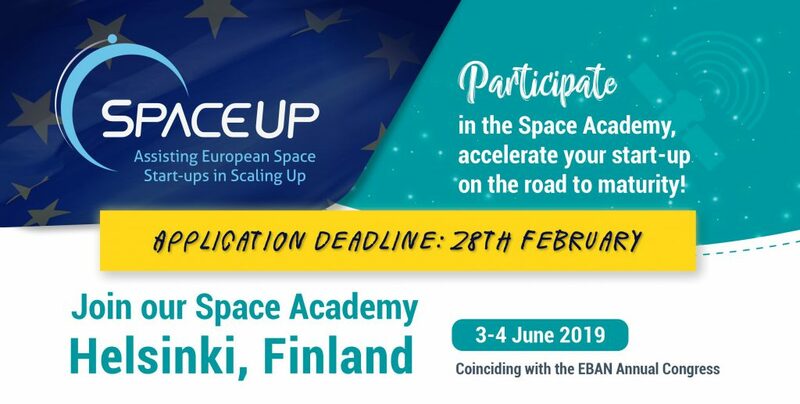 Do not miss the chance to attend the first Space Academy on the 3-4 June 2019 in Helsinki, Finland. More information and details will be released via the SpaceUp website, which is where companies interested in participating can apply. Also signup here to the newsletter to get notified of ongoing updates and news. Day 1: An intense day where entrepreneurs can improve their skills and get insights from experts on various topics, with six parallel workshops as well as one-to-one coachings and roundtable meetings. Day 2: Panels and keynote sessions with space actors and investors, involving regional industry for cross-clustering. Pitching from 10 start-up companies (coached by SpaceUp experts) to this audience for high-level feedback. European Space ecosystem, how to connect with international space institutions and corporates, and apply to ESA Invitation to Tender (ESA ITT). Up to €400 reimbursement for eligible travel and hotel costs. SpaceUp is a project financed by the EU Framework programme for Research and Innovation (Horizon 2020). The overall objective of SpaceUp is to contribute at a European level to the safeguarding and further development of a competitive and entrepreneurial space industry. Throughout the project lifetime six Space Academies will take place in various locations in Europe, networking new space tech entrepreneurs with potential partners in Finance, Business, Space Clusters and Science Parks, plunging Start-ups into a genuinely European Space ecosystem.